We left the completion of the air conditioning issues until the last day. 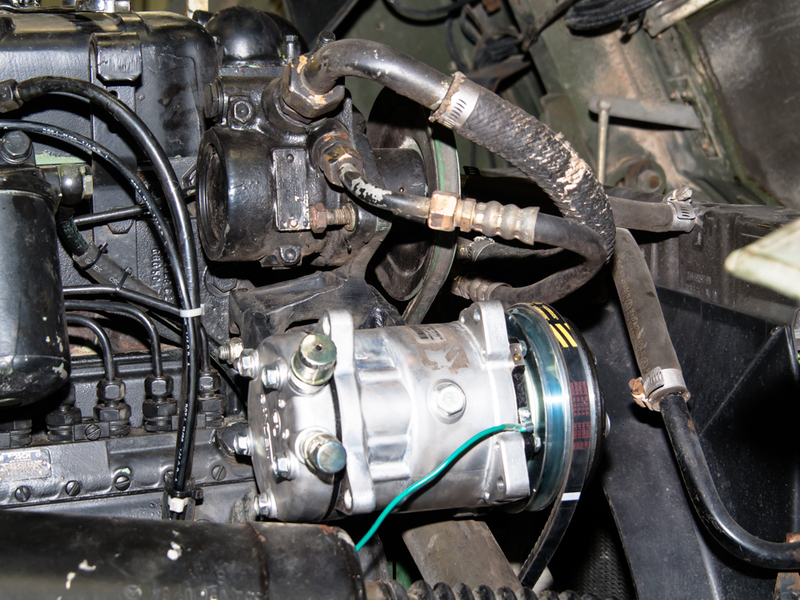 We were able to obtain a 24V compressor unit and in addition to mounting the unit, the completed system had to be charged with coolant. 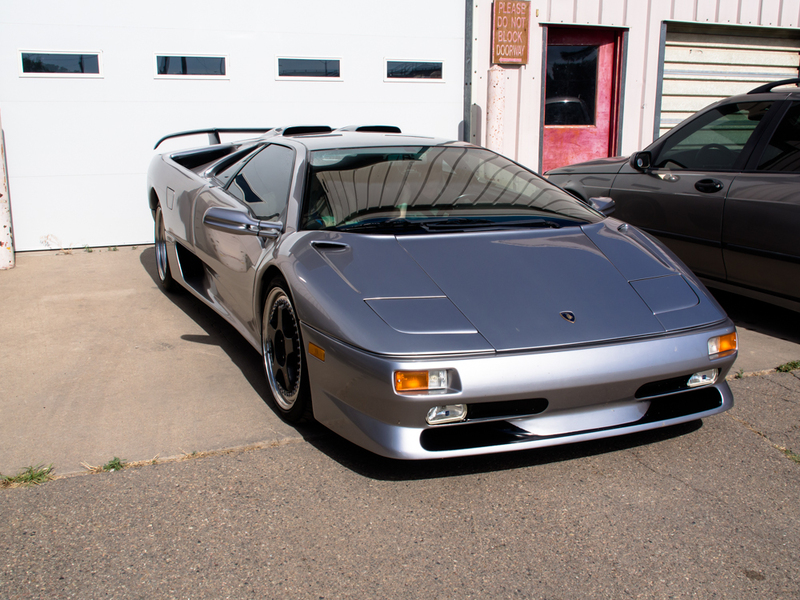 When we completed the maintenance actions, Rob took us both for a ride in his Lamborghini Diablo. From La Junta we traveled west to Mogote, NM. The new compressor arrived from NAPA. We did an inspection and determined it matched the expected part number. Part of the plan was to rework the a/c mount. 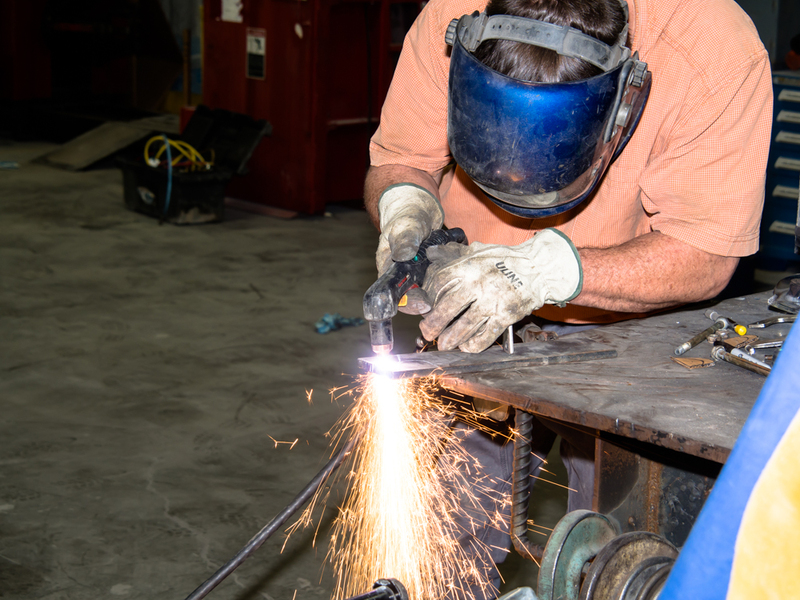 Above, Rob cuts some "ears" from 3/8" plate. 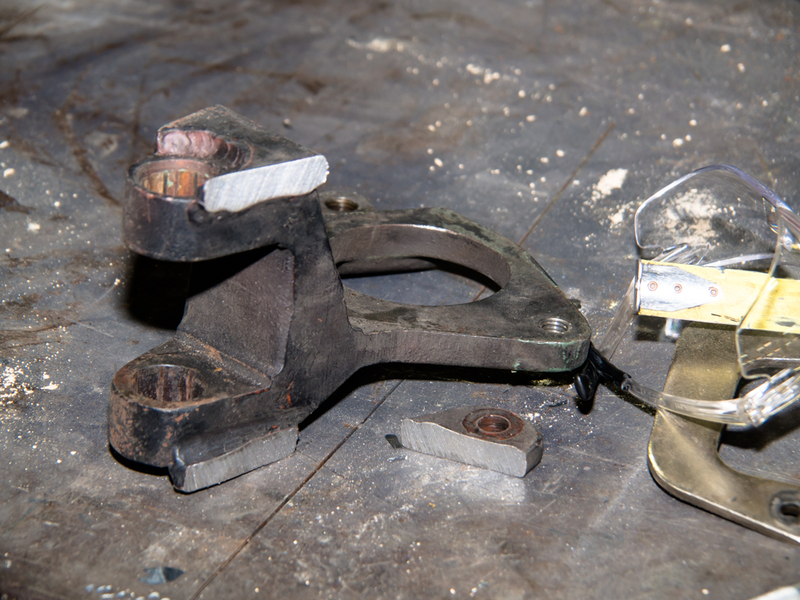 The old ears were cut of the mount using a porta-band saw. 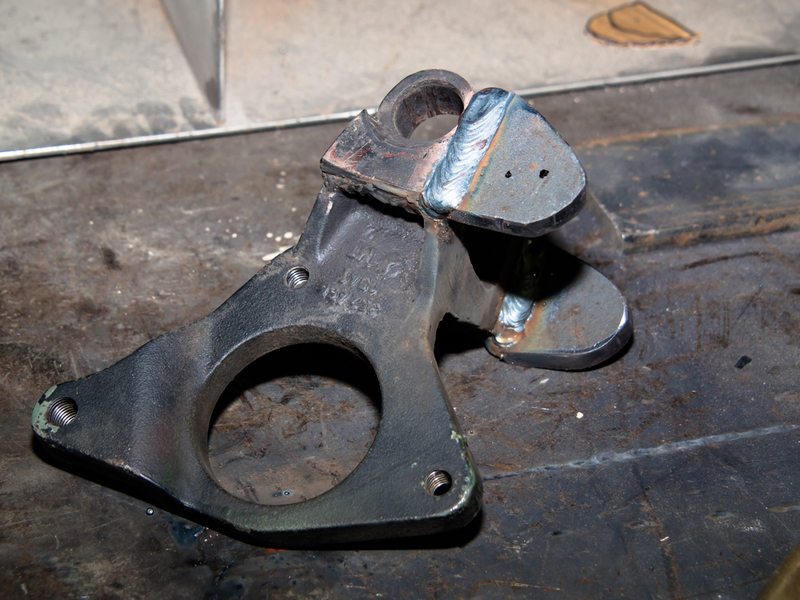 The new ears were welded on and marked for drilling. 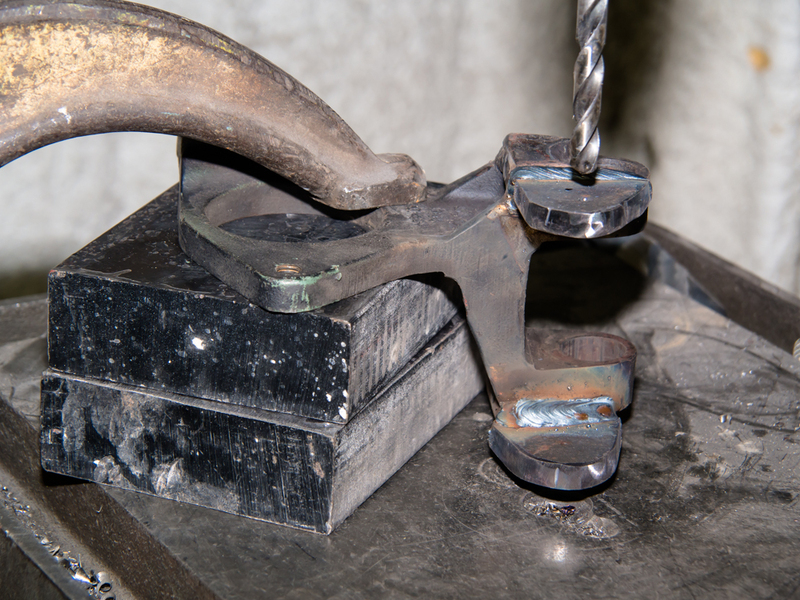 The drill press required some special jig to support the mount for drilling. 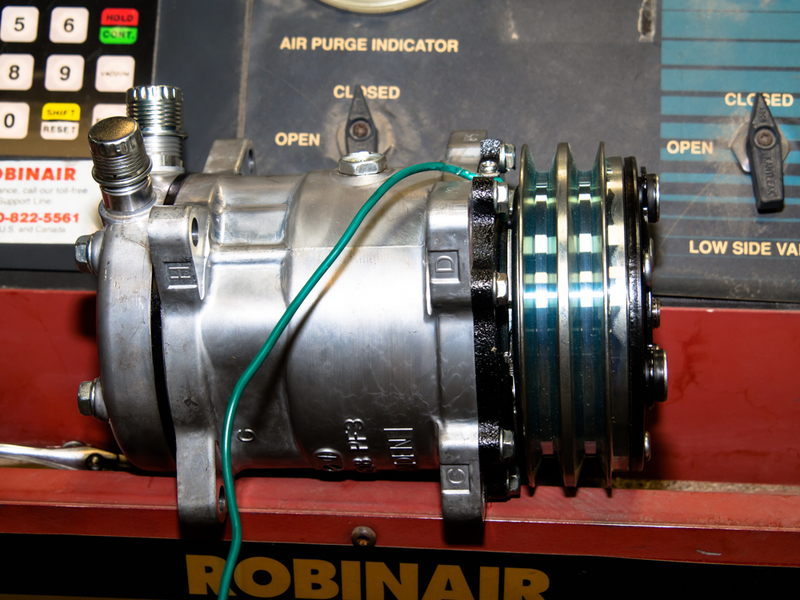 The compressor was mounted and the belt installed. Rob took us for a ride in his Diablo. 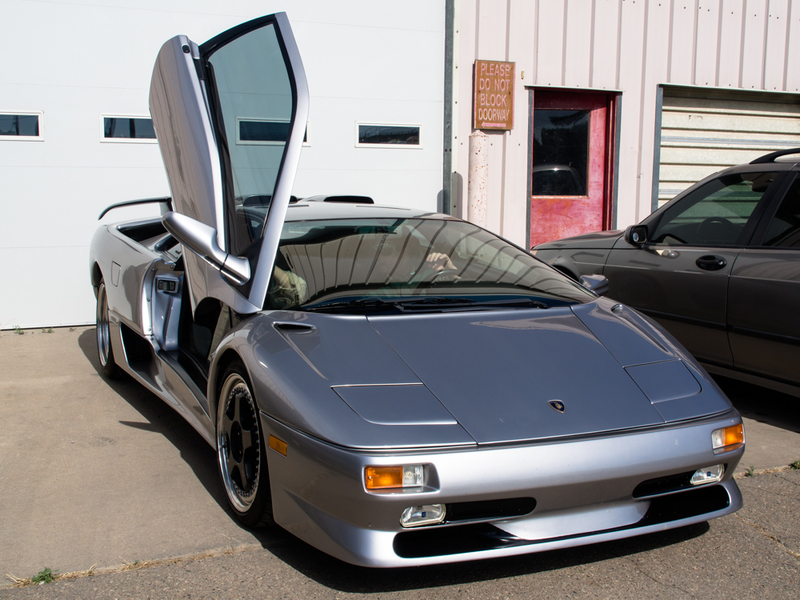 The Diablo is a mean machine with 500+ hp and a very high top speed. We left La Junta and headed west past Walsenburg. From La Veta pass we headed toward Alamosa but had to divert south because of the "South Fork" fire which had Wolf Creek Pass closed. 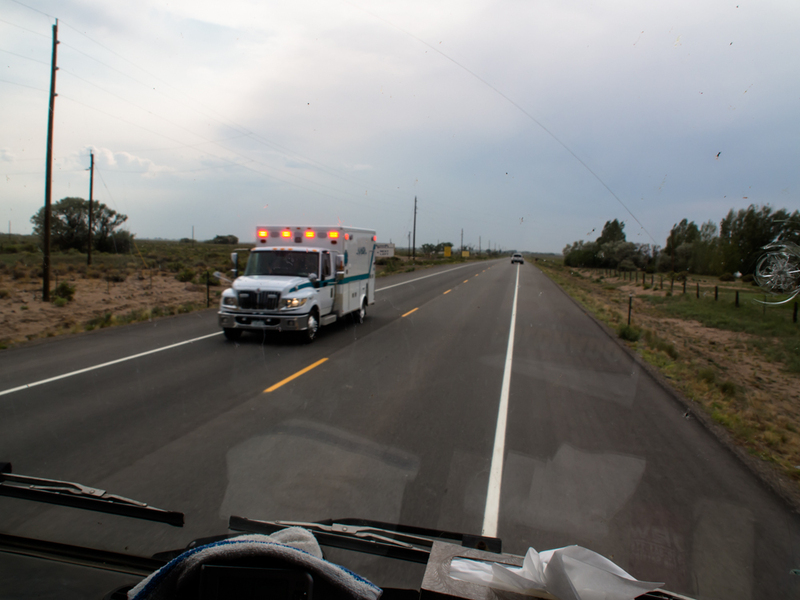 En route to Alamosa, we passed 10+ pieces of emergency equipment headed east to some event that happened behind us. The ambulance was just one of many that passed us. 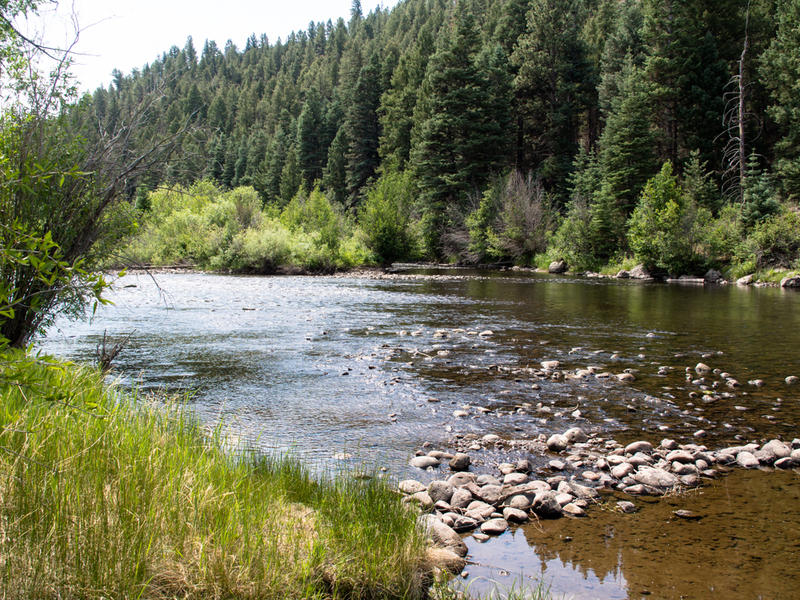 We ended up at the Mogote, NM camp area right on the Conejos River. The stream-side camp was quiet but a bit buggy. From Mogote, we went over a 10,000 foot pass to Chama, NM. 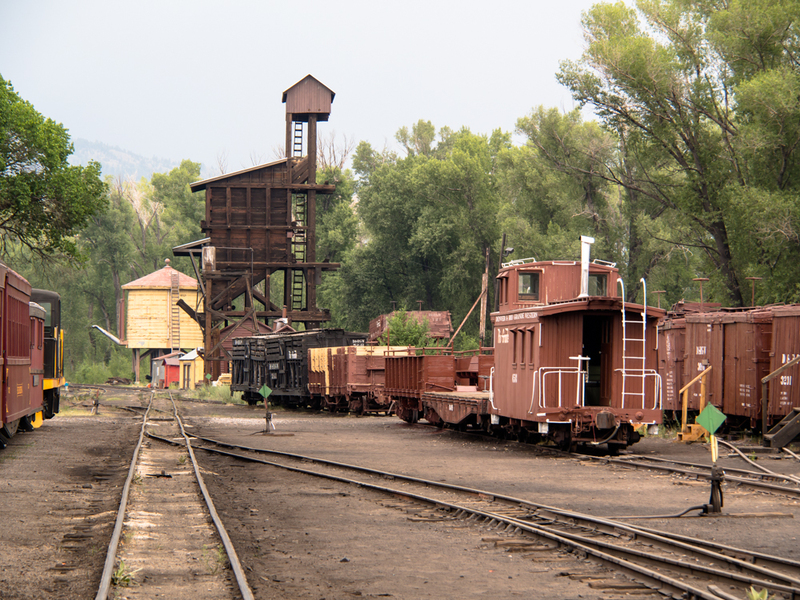 Chama hosts the Chama-Antonito narrow gauge railroad called the "Cumbres and Toltec Railroad". 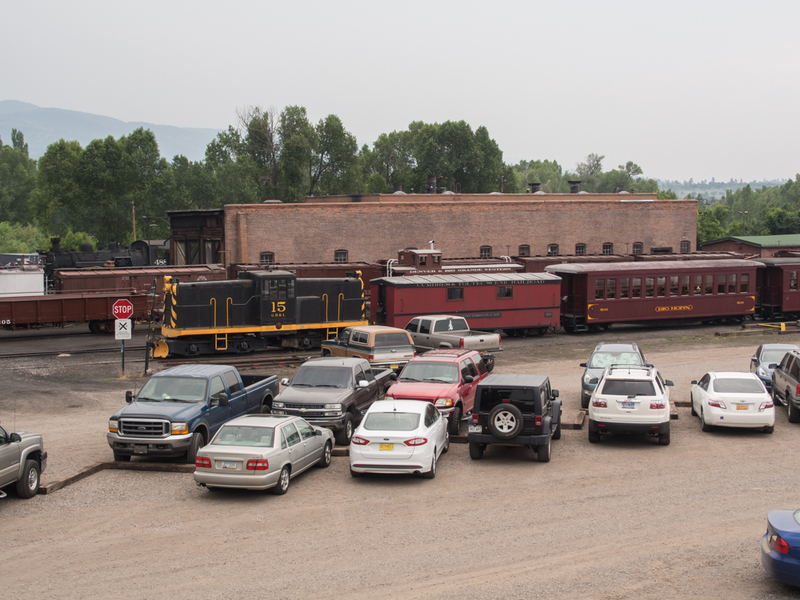 The yard at Chama was filled with tourist's cars awaiting passage on the steam train. 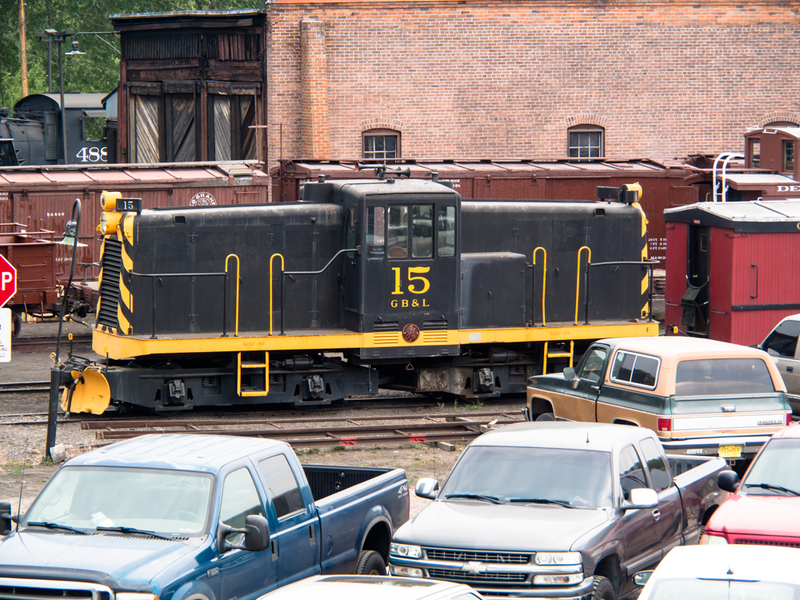 The Chama rail yard also had several later model diesel-electric locomotives used to shuttle cars in the yard. 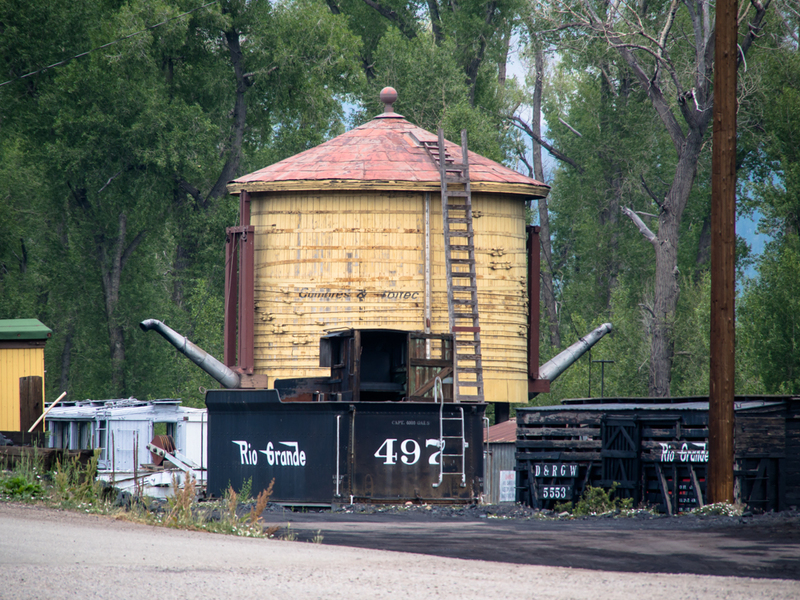 This old water tower is used to fill the steam engines. 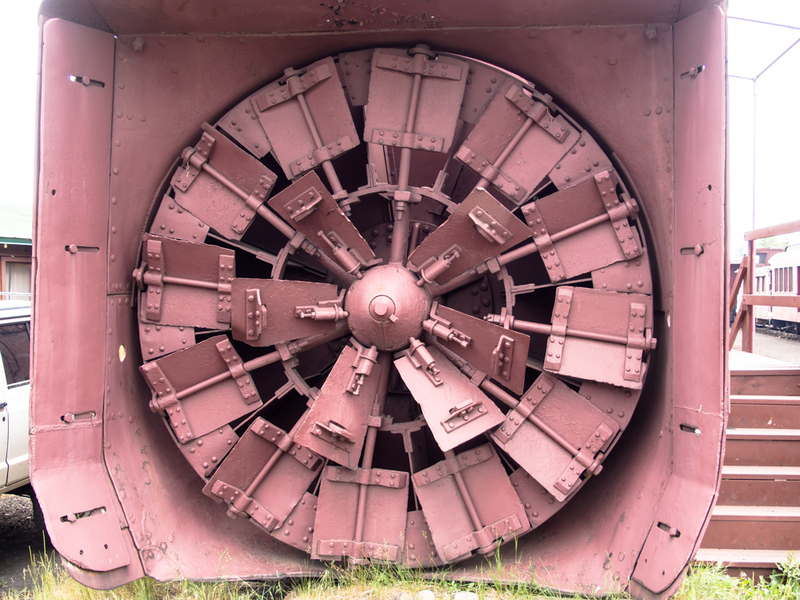 This is a steam-powered rotary snow plow. 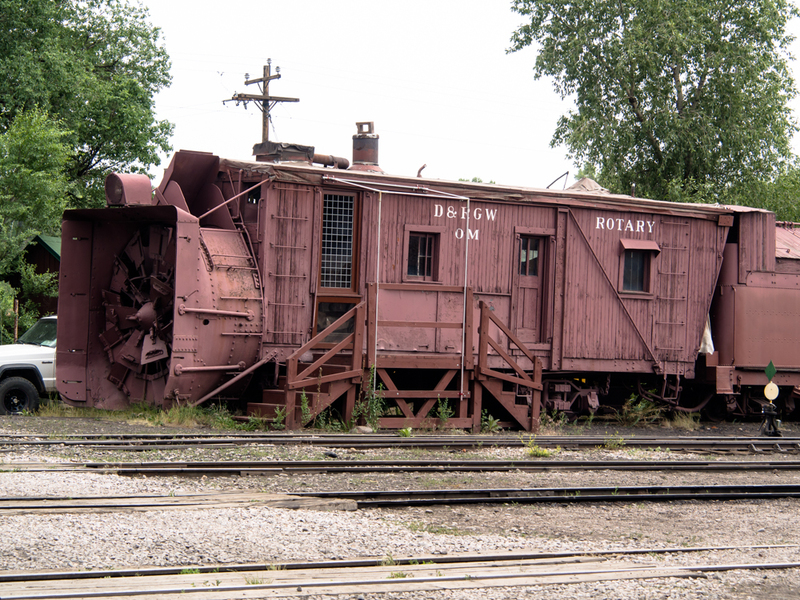 The plow required another steam engine to provide motion while the steam power within the plow was used to turn the blower. Note the blower points to the right. Another rotary plow with the blower pointed to the left. 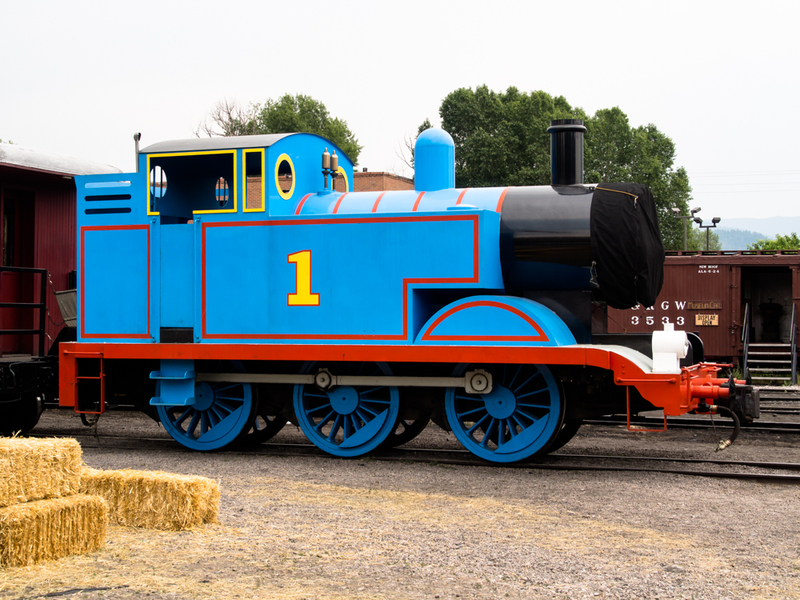 This looks like something for the children, but it is an actual working engine. 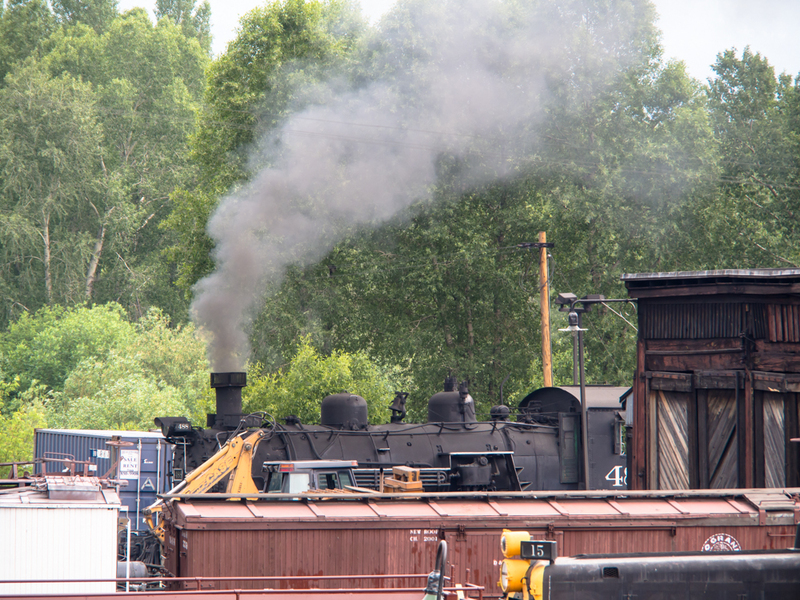 At the end of the yard is the coaling station for the engines. 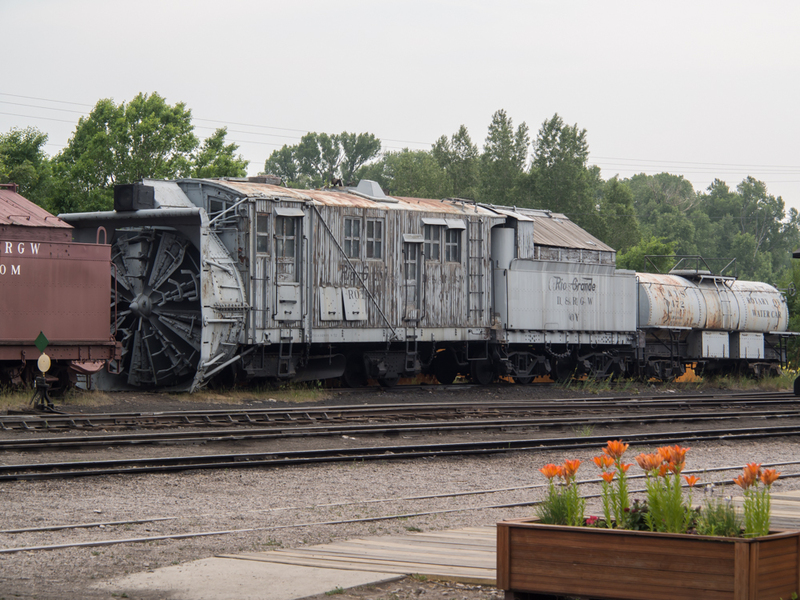 We were able to get close to the rotary plows and see the blower assembly. 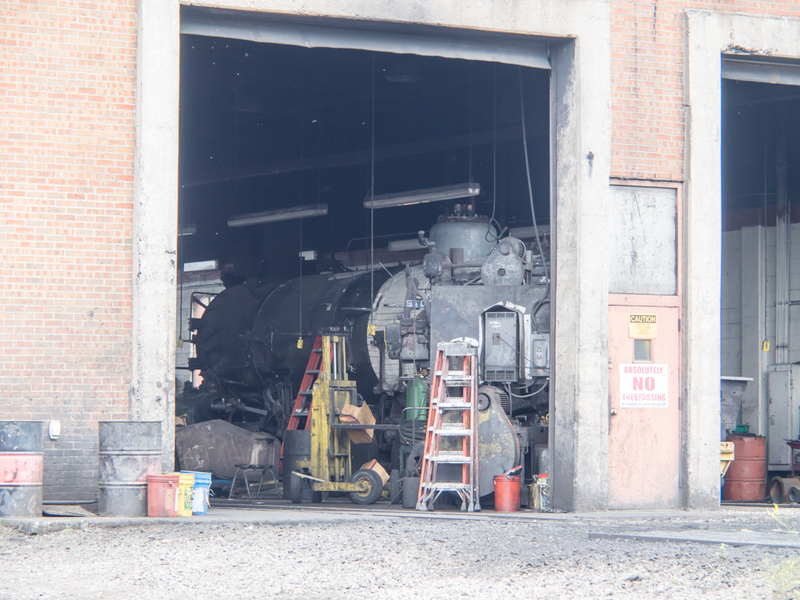 The shop area was off limits, but we could see that there were several engines in the shop being repaired. One of the engines was coming out of the shop and just being fired up. From Chama, we headed west to Durango, CO to visit our friends Brad and Laura. We had a great BBQ prime rib at Brad's accompanied with plenty of liquor. 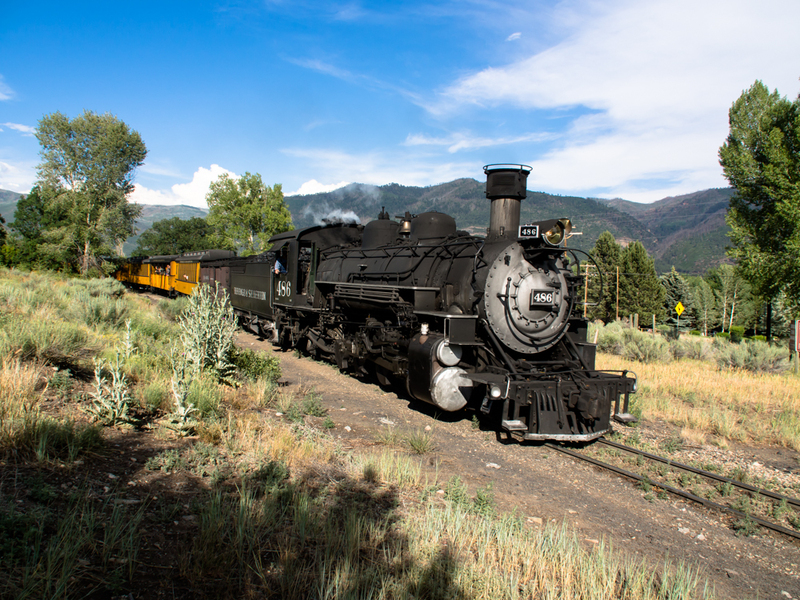 Next morning, we heard the train whistle from the DSNGRR steam train coming north from Durango. I hustled out of the house and across the tracks to await the approach of the train. 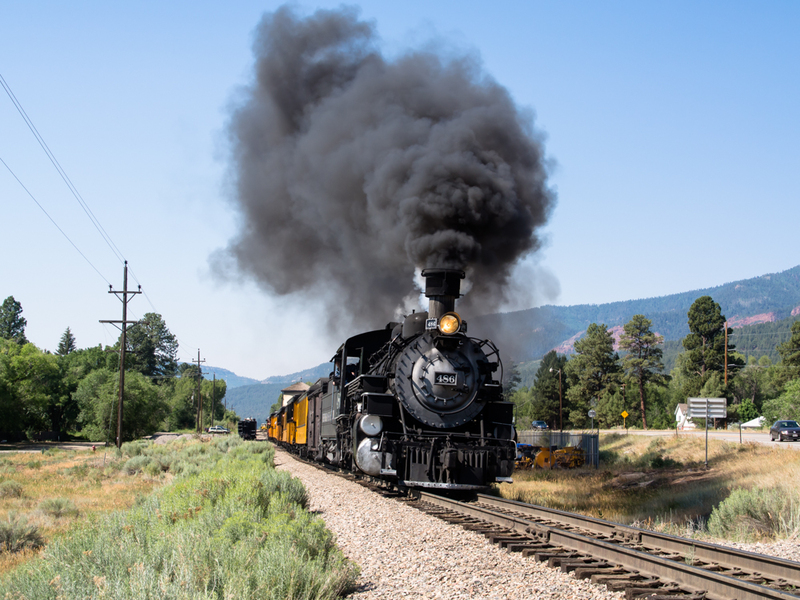 Running north from Durango is uphill and the trains blow an incredible amount of smoke. 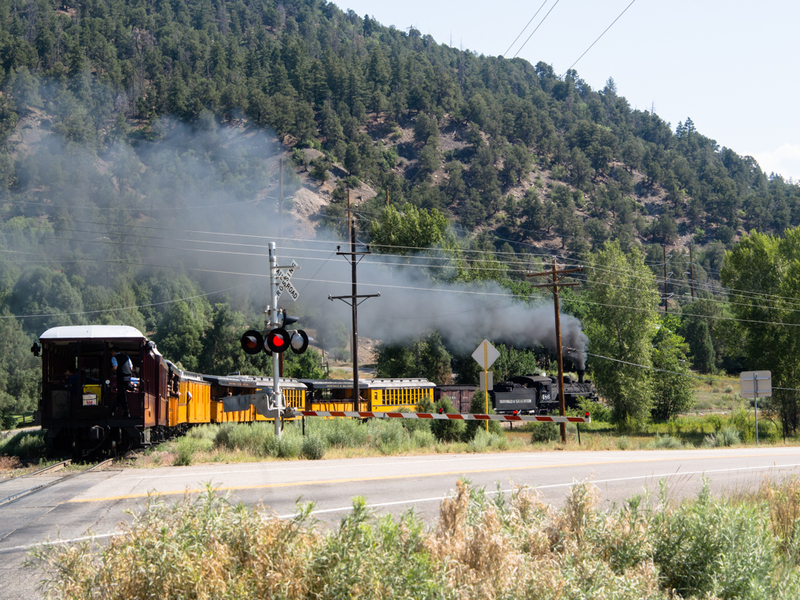 The Sunday train was full with tourists for the ride to Silverton, CO. When the train approaches the crossing signals stop traffic on the main highway. Walking back to Brad's place I got a nice view of the cliffs in the distance. Later in the day we packed a picnic lunch and headed to the Hermosa basin with our gear. 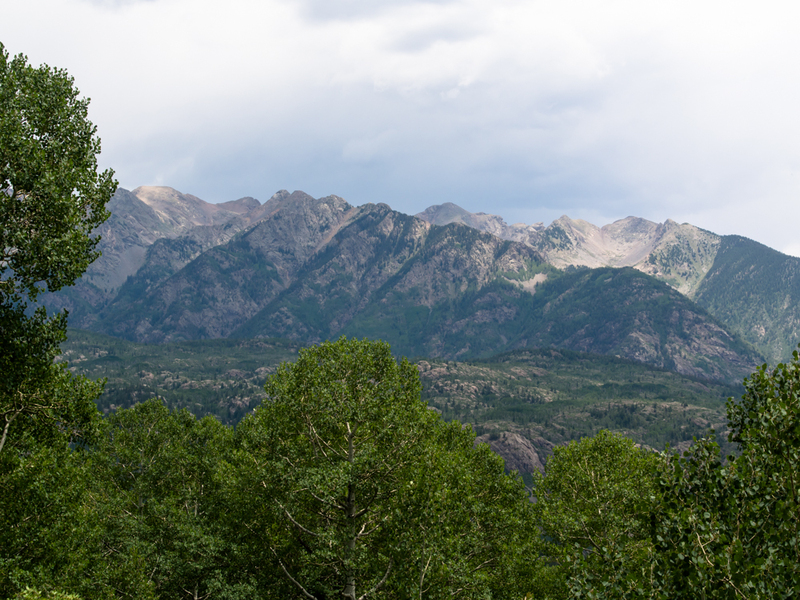 From the trail we got a nice view of the San Juan mountains to the east. After our day out at Hermosa we encountered the train returning at the end of the day. 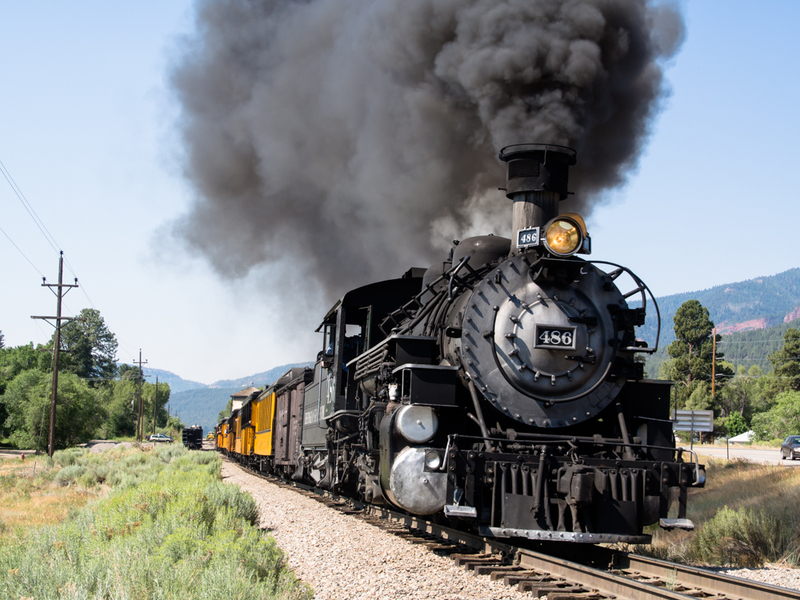 Note that there is almost no smoke on the down-grade run. 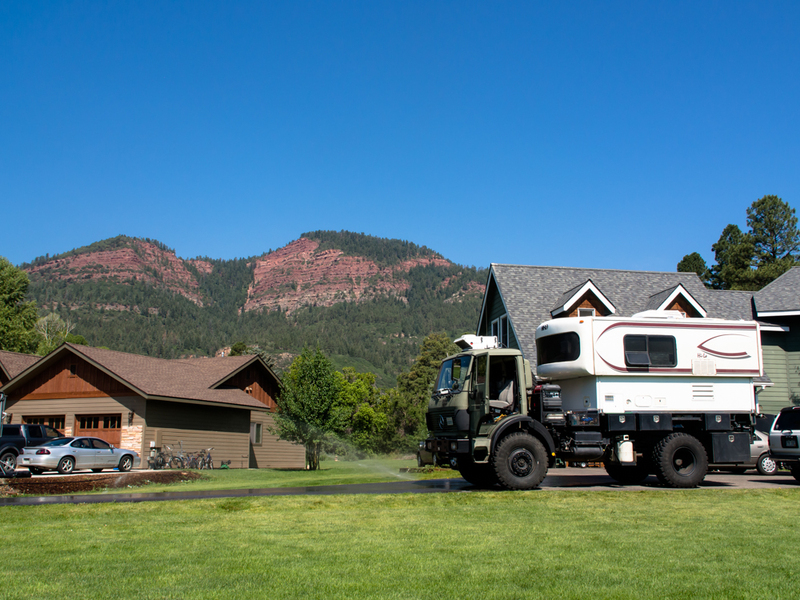 We were happy to complete our maintenance actions in La Junta. The weather turned against us and was well over 100 degrees when we left La Junta. 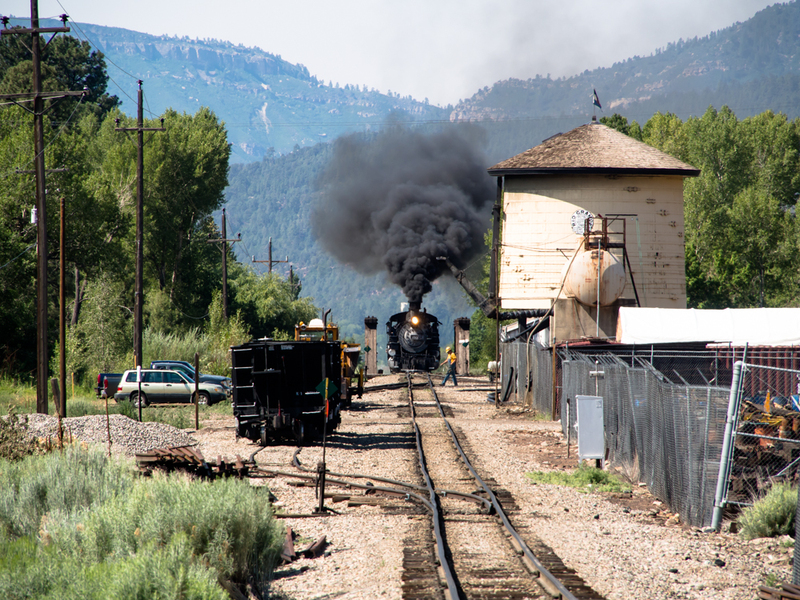 The a/c repairs worked as expected and the 2 day trip to Durango went without incident. It was great to see Brad and Laura again and greatly appreciate them including us in their family events. Tomorrow, we have to knuckle-down and make some miles toward Tucson, AZ and my father's 92nd birthday party.